This past summer my in-laws celebrated their 40th wedding anniversary with a country barn dance. It was held at their farm and my mother-in-law self-catered a majority of the meal for 300 guests. I designed and created napkin bundles. 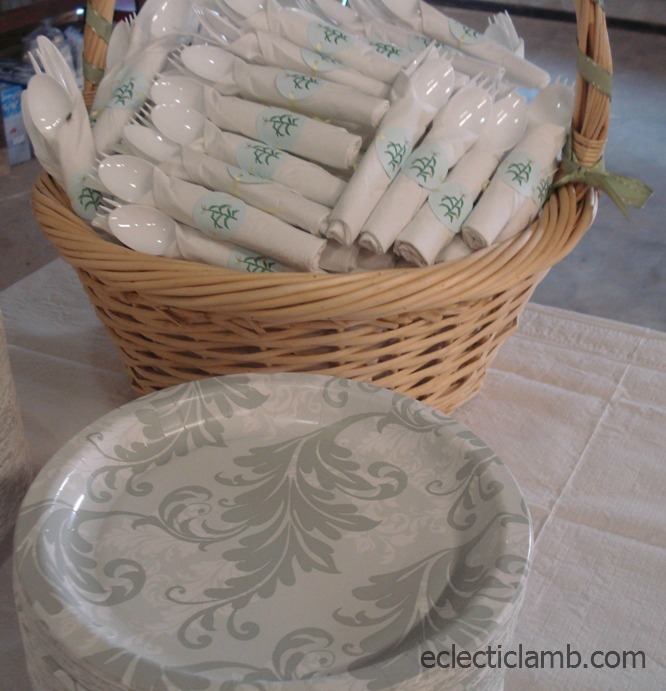 The napkins and plates were an elegant green/gray. I decided on corn and 40 as the two choices. I came up with two prototypes and let my mother-in-law choose. 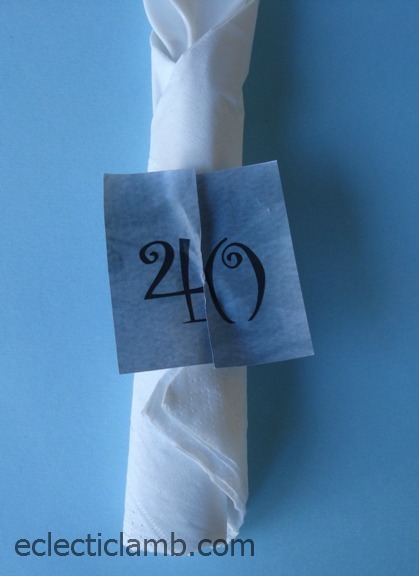 For the 40 napkin ring choice I scanned in the napkin and modified this from Merriment Design. The design is a modification of a Martha Stewart napkin ring. As you already know since at the top of this post is an image of the corn napkin rings, my mother-in-law decided on the corn. I needed to make 300 paper circles. I first bought the Martha Stewart 1.5 inch circle punch. I had a lot of problems punching clean edge circles. Since I live in the countryside I had to drive an hour back to the city to buy another hole punch. 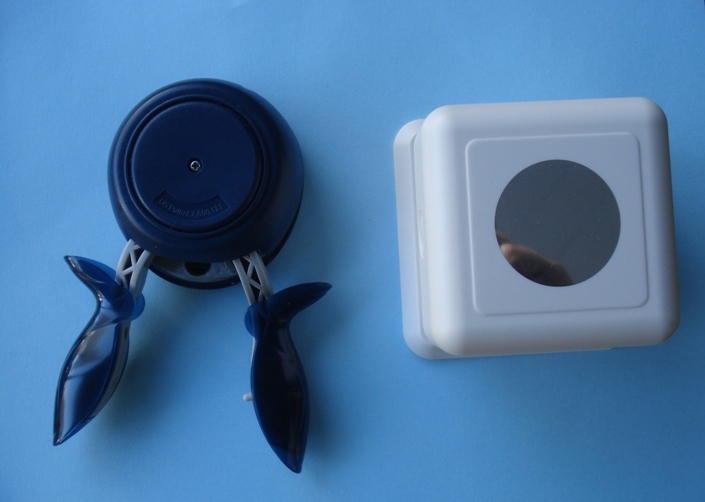 I bought the Fiskars punch and was relieved when I got home that it worked great. It was easier on my hands and the result was a perfectly cut circle. 1. Draw and color image of your choice. 2. Scan image and create a transparent background. 3. Create page of images (to print many at one time). 4. Print images onto card stock color of your choice. 5. Use Fiskars 1.5 inch punch to cut out circles. 8. Fold napkin with knife, fork, and spoon inside. 9. Tie napkin ring on napkin bundle. 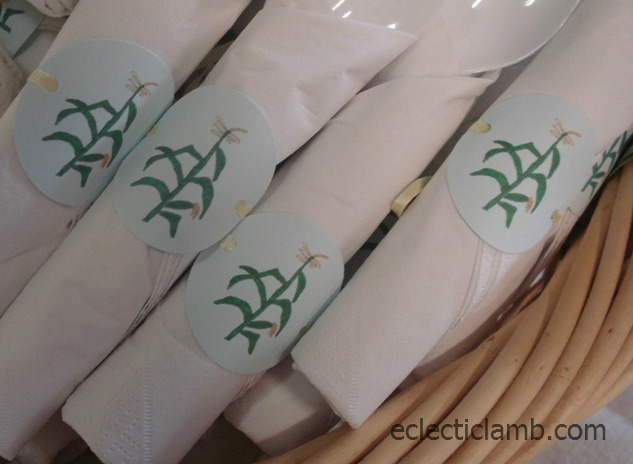 If you want to use my corn napkin rings, just leave a comment and I will send you the file. 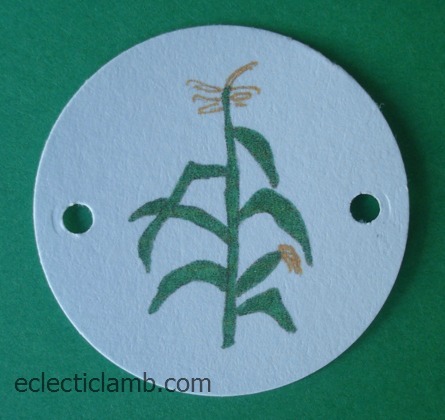 I love the end result – the corn stalk is elegant too to go with everything. Wow, I am very impressed with your creativity. Have not been blogging lately. My daughter has been in the hospital 26 weeks pregnant. She is now 37 weeks and the doctor will be inducing her on Tuesday. We are very thankful. The baby is small now, 5lbs 13 ozs. But at least the baby healthy. Anyway, being in a room looking at four walls for weeks was difficult on her. So Peter and I took turns staying during the day with her. Her husband stayed at night. That took a lot out of me. I rested on my off days. The hospital is an hour away. We also cooked everyday for them. The hospital food really was not good enough to feed a dog, let alone give to a women who is feeding a baby in her. Although I am tired, I would do it all again. GOOD NEWS: My other daughter is Pregnant. Her doctor tells her the baby is wonderful and very chubby. Hope to catch up with you on skype soon.